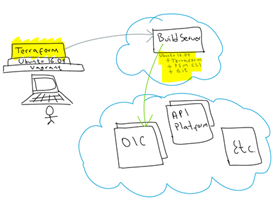 Previously, I showed how to use Terraform and PSM CLI to spin up a “Build Server” and use it to provision Oracle Integration Cloud (OIC) environments. You can find this blog here. In this blog I am going to show you how to do the same, but to provision Oracle API Platform environments. I encourage you to read the previous blogs, which I am building on top. How to use Terraform to provision Oracle Integration Cloud, click here. How to use Terraform, click here. How to use PSM CLI, click here. How to use Vagrant. click here. You need an Oracle Cloud account, if you don’t have one yet, request a trial, they are free. I already explained with step by step instructions how to build your “Build Server” in a previous blog. Please refer to this blog if you have not yet created your “Build Server”. The way I create the “Build Server” allows you to deploy any Oracle PaaS, this is a list of some of the available services in my Oracle Cloud environment: Read the complete article here.